28/3/2019 Get your opioids rolling! Our new work shows how opioid agonist remifentanil biases how we see & feel the world: Heiskanen, T., Leppä, M., Suvilehto, J., Akural, E., Larinkoski, T., Jääskeläinen, I.P., Sams, M., Nummenmaa, L., & Kalso, E. (in press). The opioid agonist remifentanil increases subjective pleasure. British Journal of Anaesthesia. 14/2/2019: The show must go on! Emotion Lab in prime time – see the whole spectacle here. 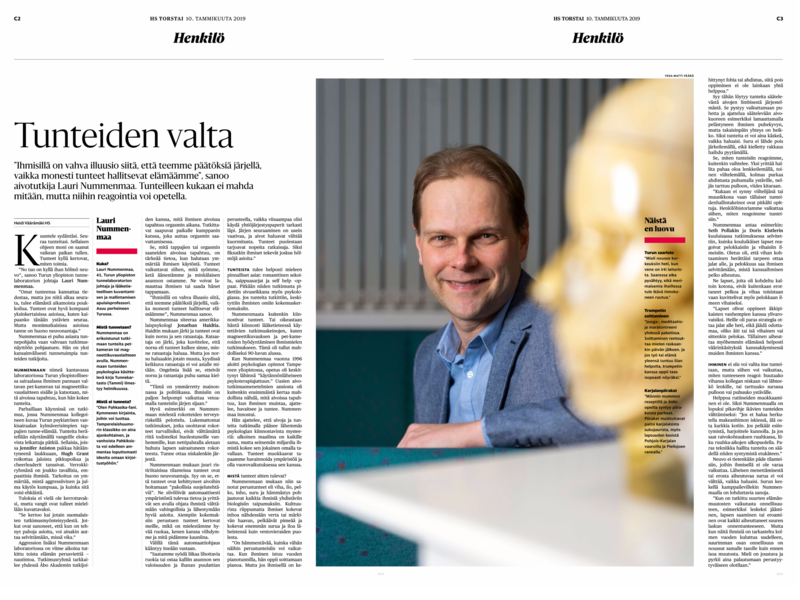 10/1/2019: Helsingin Sanomat has a large feature on Emotion Lab – we rock! 22/12/2018: A Christmas Gift for You from Emotion Lab: Lauri’s new piece on embodied consciousness in Aeon: It is not all in your head. Sometimes, it’s in your legs! 14/12/2018: Onni is alive! Emotion lab has released its new web experiment toolkit – be sure to check the preview before we put it on git. And make sure you try out the Great Yngwie Experiment! 14/11/2018: New venues for emotion lab in psychosis research! Cool new collaboration with Park lab in Vanderbilit: Torregrossa, L., Snodgrass, M., Hong, S.-J., Heathman, N., Glerean, E., Nummenmaa, L., & Park, S. (in press) Anomalous bodily maps of emotions in schizophrenia. Schizophrenia Bulletin. 15/11/2018: Juulia Suvilehto has landed! All the way from Oxford she’s ready to defend her thesis Maintaining social bonds via touching: A cross-cultural study today. Be ready for some serious action – she’s surely a Rising Force! 11/11/2018: Celebrate the Father’s Day, Remembrance Day, and Corduroy Appreciation Day by reading about Exploring Emotions in UTU Life & Science! 14/10/2018: Fourth paper out and Tomi is ready to wrap up the thesis! Another fascinating PET-fMRI piece on emotion & opioids: Karjalainen, T., Seppälä, K., Glerean, E., Karlsson, H.K., Lahnakoski, J.M., Nuutila, P., Jääskeläinen, I-P., Hari, R., Sams, M., Nummenmaa, L. (in press). Opioidergic regulation of emotional arousal: A combined PET–fMRI study. Cerebral Cortex. 9/10/2018 Congratulations to Tatu for receiving a fantastic personal grant from the Jenny and Antti Wihuri Foundation for working on the role of opioid and endocannabinoid systems in appetite and obesity! We also express our cordial thanks to our funders – top research research is impossible without well-targeted funding! 26/09/2018 Book announcement! The new Finnish pop-sci book from the Emotion Lab is coming in Winter 2019: Nummenmaa, L. (in press). Tunnekartasto. Helsinki: Tammi. 28/08/2018 How does THAT make you feel? Map of human feeling space now out in PNAS: Nummenmaa, L., Hari, R., Hietanen, J.K., & Glerean, E. (in press). Maps of subjective feelings. Proceedings of the National Academy of Sciences of the United States of America. More info, press quality images and videos here. 20/08/2018 Neurokinin 1 receptors are not affected by major depression – the first-ever experimental demonstration using PET: Nyman, M.J., Eskola, O., Kajander, J., Jokinen, R., Penttinen, J., Karjalainen, T., Nummenmaa, L., Hirvonen, J., Burns, D. Hargreaves, R., Solin, O., & Hietala, J. (in press).Brain neurokinin-1 receptor availability in never medicated patients with major depression: A pilot study Journal of Affective Disorders. 12/8/2018 Lab getting back to business after summer vacation! Another fascinating paper on brain-body axis done with PET is out: Rebelos, E., Immonen, H., Bucci, M., Hannukainen, J.C., Nummenmaa, L., Honka, MJ., Soinio, M., Salminen, P., Ferrannini, E., Iozzo, P., & Nuutila, P. (in press). Endogenous glucose production is associated with brain glucose uptake in morbidly obese subjects. Diabetes, Obesity and Metabolism. 28/6/2018 Nice new collaboration with BML and Aalto University – will be useful for anyone working on pattern classification: Gotsopoulos, A., Saarimäki, H., Glerean, E., Jääskeläinen, I.P., Sams, M., Nummenmaa, L., & Lampinen, J. (in press). Reproducibility of importance extraction methods in neural network based fMRI classification. NeuroImage. 16/6/2018 New doctor in the house! Tiinuli successfully defended her thesis Neurobiology of Physical Exercise: Perspectives on Psychophysiological Effects and Opioidergic Neurotransmission today. Another smashing show – no prayer for the opponent! 15/6/2018 It’s grant time – excellent! This Friday we congratulate Lihua for landing a fantastic 3-year post-doc funding from the Turku Collegium for Science and Medicine! Party on, Lihua! 15/6/2018 The sun is out so time to hit the track for some good old fashioned endorphin rush (and also to read the paper by Tiinuli and UG): Saanijoki, T., Nummenmaa, L., Tuulari, J.J., Tuominen, L., Arponen, E., Kalliokoski, K. & Hirvonen, J. (in press). Aerobic exercise modulates anticipatory reward processing via the μ-opioid receptor system. Human Brain Mapping. 25/3/2018 Yet another nice collaboration with Aalto University’s BML and Patrik Vuilleumier’s group from Geneve: Decoding distributed nature of emotions from the brain with MVPA: Saarimäki, H., Ejthedian, L.F., Glerean, E., Jääskeläinen, I.P., Vuilleumier, P., Sams, M., & Nummenmaa, L. (in press). Distributed affective space represents multiple emotion categories across the brain. Social Cognitive and Affective Neuroscience. 10/04/2018 Antidepressants may help to counter depressive rumination – cool new clinical fMRI drug trial in collaboration with Helsinki University and Oxford University: Komulainen, E., Heikkilä, R., Nummenmaa, L., Raij, T., Harmer, K., Isometsä, E., & Ekelund, J. (in press). Short-term escitalopram treatment normalizes aberrant self-referential processing in major depressive disorder. Journal of Affective Disorders. 16/3/2018 Latest piece on our opioids, feeding, and obesity project now out: Nummenmaa, L., Saanijoki, T., Tuominen, L., Hirvonen, J., Tuulari, J.J., Nuutila, P., & Kalliokoski, K (in press). μ-opioid receptor system mediates reward processing in humans. Nature Communications. 28/2/2018 This year’s first publication comes with MORE YNGWIE MALMSTEEN! Check out our review (or at least Fig 1E) on brain basis of mutual understading: Nummenmaa, L., Lahnakoski, J., & Glerean, E. (in press). Sharing the social world via intersubject neural synchronization. Current Opinion in Psychology. 2/3/2018 Our nice MGH Martinos Center collaboration provides more evidence for opioid system and overeating: Joutsa, J.J., Karlsson, H.K., Majuri, J., Nuutila, P., Helin, S., Kaasinen, V., & Nummenmaa, L. (in press). Binge eating disorder and morbid obesity are associated with lowered mu-opioid receptor availability in the brain. Psychiatry Research: Neuroimaging. 30/11/2017 The most difficult paper to publish in the lab’s history is finally out! Behold the future classic: Smirnov, D., Lachat, F., Peltola, T., Lahnakoski, J.M., Koistinen, O-P., Gleran, E., Vehtari, A., Hari, R., Sams, L., & Nummenmaa, L. (in press). Brain-to-brain hyperclassification reveals action-specific motor mapping of observed actions in humans. PLoS One. 18/12/2017 Looks like we’re on Santa’s “nice” list – another grant falling to the Emotion lab! This time we congratulate Tomi Karjalainen and thank the Päivikki and Sakari Sohlberg foundation. 20/11/2017 Our cordial thanks to the Valon Vuoksi foundation for supporting Lihua’s work in out social and antisocial brain project! 22/11/2017 Scientific American covers our work on feeding and opioid release! See also the original paper here, and be sure to read our work showing how brain’s opioid receptors contribute to obesity. 20/11/2017 Another nice grant to the Emotion lab! This time we congratulate Tomi Karjalainen and thank the Paulo fondation! 16/11/2017 Emotion lab is also sometimes diabetes lab! A new ultra-cool collaboration with Markku Laakso’s group out now: Latva-Rasku, A., Honka, M-J., Stancakova, A., Koistinen, H., Kuusisto, J., Guan, L., Manning, A., Stringham H., Gloyn, A., Lidgren, C., Collins, F., Mohlke, K, Scott, L., Karjalainen, T., Nummenmaa, L., Nuutila, P., & Laakso, M. (in press). A partial loss-of-function variant in AKT2 is associated with reduced insulin-mediated glucose uptake in multiple insulin sensitive tissues: a genotype-based callback positron emission tomography study. Diabetes. 10/11/2017 Ever gotten a “runner’s high” while working out? Hear Jussi “Uge” Hirvonen explain what PET reveals about exercise-induced euphoria in this cool Neuropsychopharmacology podcast. If you want more (as Yngwie fans should!) you can read our original paper here. 30/10/2017 Massive congratulations to Sandra Manninen for getting a nice grant for working on opioids and sociability, and Juulia Suvilehto for getting another one for investigating social touching. Go ladies! We cordially thank Alfred Kordelin Foundation for their geneorus support to our work! 27/10/2017 Halloween is soon here, and Matthew tells you (in Finnish) what we are afraid of, and why we like horror movies. Read the full story at Turun Sanomat! 10/10/2017 Turku PET Centre Brain Imaging course slides are now online. Go ahead and take a look if you did not hava a chance to attend! 30/9/2017 Further evidence confirming that emotional processing depends on awareness – a nice collaboration with Disa Sauter’s group: Lähteenmäki, M., Kauramäki, J., Sauter, D., & Nummenmaa, L. (in press). Auditory affective processing requires awareness. Emotion. See also our prior study on visual processing! 15/8/2017 Tomi and Lauri comment on the role of opioids in the highs and lows of human social life: Nummenmaa, L., & Karjalainen, T. (in press). Opioidergic regulation of pain and pleasure in human social relationships. Neuropsychopharmacology reviews. 24/08/2017 The emotional (dis)pleasures of grinding revealed by our dear Tiinuli: Saanijoki, T., Nummenmaa, L., Koivumäki, M., Löyttyniemi, E., Kalliokoski, K.K., & Hannukainen, J.C. (in press). Affective adaptation to repeated SIT and MICT protocols in insulin resistant subjects. Medicine and Science in Sports and Exercise. 21/08/2017 Very nice commentary on our laughter and opioids work by Fausto Caruana from the Parma group: Caruana, F. (2017). Laughter as a neurochemical mechanism aimed at reinforcing social bonds: integrating evidence from opioidergic activity and brain stimulation. The Journal of Neuroscience. 14/08/2017 The Emotion Lab just keeps on growing! We would like to welcome Vesa Putkinen and Sanaz Nazari Farsani to our wonderful team! You can read more about their work on our People page. 1/08/2017 It’s summer and time for some serious exercise! Go for the high-intensity interval training to make those opioids flow (and also check out our new paper): Saanijoki, T., Tuominen, L.J., Nummenmaa, L., Arponen, E., Kalliokoski, K., & Hirvonen, J. (in press). Acute aerobic exercise increases µ-opioid receptor availability in humans. Neuropsychopharmacology. 07/07/2017 Read our up-to-date mini-review & commentary on basic emotions and pattern recognition that will appear in a theme issue on neuroimaging of emotions curated by Tor Wager and Alex Shackman: Nummenmaa, L., & Saarimäki, H. (in press). Emotions as discrete patterns of systemic activity. Neuroscience Letters. 06/07/2017 The final piece of our opioids, feeding, and obesity project is now out, confirming that feeding releases opioids in healthy humans: Tuulari, J.J., Tuominen, L., de Boer, F., Hirvonen, J., Nuutila, P., & Nummenmaa, L. (in press). Feeding releases endogenous opioids in humans. The Journal of Neuroscience. See also our papers on how obesity downregulates cerebral opioid receptors, and how these adverse changes may be reversed with obesity surgery. 11/06/2017 We made it to the cover of Human Brain Mapping with our paper on channel surfing with Darth Vader, Indiana Jones, and 007. 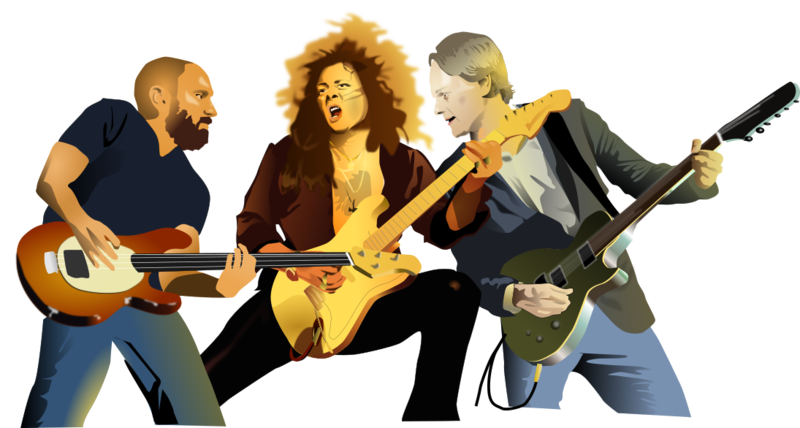 What a great illustration by our post-doc alumni Juha Lahnakoski! 03/05/2017 Another new PET-fMRI paper on opioidergic basis of sociability with the good old team: Karjalainen, T., Karlsson, H.K., Lahnakoski, J.M., Glerean, E., Nuutila, P., Jääskeläinen, I.P., Hari, R., Sams, M., & Nummenmaa, L. (in press). Dissociable roles of cerebral μ-opioid and type 2 dopamine receptors in vicarious pain: A combined PET–fMRI study. Cerebral Cortex. 16/05/2017 Cognitive Neuroscience Society covers our work on event integration while viewing Star Wars, Indiana Jones, and James Bond during brain scans. 11/04/2017 A nice collaboration with PET Centre and Harvard, Oxford, & Aalto Universities with laughable findings: Manninen, S., Tuominen, L., Dunbar, R.I.M., Karjalainen, T., Hirvonen, J., Arponen, E., Hari, R., Jääskeläinen, I.P., Sams, M., & Nummenmaa, L. (in press). Social laughter triggers endogenous opioid release in humans The Journal of Neuroscience. 30/03/2017 Wonderful to be collaborating with Jukka Hyönä’s group again – this time on object tracking: Li, J., Oksama, L., Nummenmaa, L. & Hyönä, J. (in press). Anger improves sustained attention on targets during dynamic multiple object tracking. Cognition & Emotion. 28/03/2017 We are recruiting scientists for our new flagship project on molecular neuroinformatics of CNS disorders. See here for more information. 26/03/2017 New Finnish mini-commentary on emotions, feelings, and well-being: Nummenmaa, L. (2017) Mistä puhumme kun puhumme tunteista. Tieteessä tapahtuu, 2/2017, 35-39. 24/03/2017 The Chief Customs Officers’ opinion (a.k.a review) on emotions and opioid circuits, including two meta-analyses, is now out: Nummenmaa, L. & Tuominen, L.T. (in press) Opioid system and human emotions. British Journal of Pharmacology. 22/03/2017 New paper fresh outta press, this time with Jesper Ekelund’s group: Komulainen, E., Glerean, E., Meskanen, K., Heikkilä, R., Nummenmaa, L., Raij, T.T., Lahti, J., Jylhä, P., Melartin, T., Isometsä, E., & Ekelund, J. (in press) Single dose of mirtazapine modulates whole-brain functional connectivity during emotional narrative processing. Psychiatry Research: Neuroimaging. 20/03/2017 Our cordial thanks to Sigrid Juselius Foundation for funding our large-scale neuroinformatics project on brain development and CNS disordes! Looks like we need to recruit soon again – stay tuned! 20/03/2017 New paper on natural event perception in collaboration with Aalto University and MPI: Lahnakoski, J., Jääskeläinen, I.P., Sams, M., & Nummenmaa, L. (in press) Neural mechanisms for integrating consecutive and interleaved natural events. Human Brain Mapping. 09/03/2017 Updated GIT repository for our software tools. Please update your bookmarks. 23/02/2017 Our new paper done in collaboration with Jari Hietanen’s lab is out: Chen,T., Nummenmaa, L., & Hietanen, J.K. (in press). Eye contact judgment is influenced by perceiver’s social anxiety but not by their affective state. Frontiers in Psychology . 14/12/2016 Well done Tomi Karjalainen – yeat another nice grant to the lab! This one comes from Päivikki and Sakari Sohlberg foundation, we express our cordial thanks for funding our research. 16/1/2017 Emotion lab is recruiting again! We’re looking for two post-docs in neuroimaging and a project researcher for data analysis / neuroinformatics . Please contact Lauri for further details. 29/11/2016 Congratulations to Tomi Karjalainen for receiving a personal grant from Jalmari and Rauha Ahokas Foundation! 18/11/2016 – Our new paper with University of Jyväskylä on eye movements during natural conversations is now out: Hautala, J. Lohberg, O., Hietanen, J.K., Nummenmaa, L., & Astikainen, P. (2016). Effects of conversation content on viewing dyadic conversations . Journal of Eye Movement Research, 9 , 1-12. 30/09/2016 – Human Emotion Systems Laboratory receives 300,000€ from the Academy of Finland for studying brain basis of obesity. Looks like we will be recruiting again soon – stay tuned! 01/09/2016 – Human Emotion Systems Laboratory has officially moved to Turku PET Centre. We are excited to start unraveling the molecular basis of emotions at the best human imaging centre in Finland. We are currently recruiting post-docs and PhD candidates, please contact us directly or wait for official announcements if you are interested in working with us! 18/05/2016 – Human Emotion Systems Laboratory receives 500,000€ from the Academy of Finland for studying opioidergic basis of emotions and sociability. We will be recruiting soon – stay tuned! 18/05/2016 – Our new study shows that surgical weight loss induces white and grey matter recovery in the morbidly obese: Tuulari, J.J., Karlsson, H.K., Antikainen, O., Hirvonen, J., Pham, T., Salminen, P., Helmiö, M., Parkkola, R., Nuutila, P., & Nummenmaa, L. (in press). Bariatric surgery induces white and grey matter density recovery in the morbidly obese: A voxel-based morphometric study. Human Brain Mapping. 12/04/2016 – Ville and the Martinos Center collaborators have worked out nice surface reconstruction methods for T1-EPI: Renvall, V., Witzel, T., Wald, L.L,, & Polimeni, J.R. (in press). Automatic cortical surface reconstruction of high-resolution T1 echo planar imaging data. Neuroimage. 11/04/2016 – Our theme issue “Attending to and neglecting people is now out in Phil Trans B . See also our Introductory chapter to the issue: Hari, R., Sams, M., & Nummenmaa, L. (2016). Attending to and neglecting people: Bridging neuroscience, psychology and sociology. Philosophical Transactions of The Royal Society B, 371, 1-9. 04/04/2016 – Ville and colleagues report cardiovagal responses to pain at 7 T in Phil Trans A: Sclocco, R., Reissner, F., Desbordes, G., Polimeni, J.R., Wald, L.L., Kettner, N.W., Kim, J., Garcia, R.G., Renvall, V., Bianchi, A.M., Cerutti, S., Napadow, V., & Barber, R. (in press). Neuroimaging brainstem circuitry supporting cardiovagal response to pain: a combined heart rate variability/ultra high-field (7 T) functional magnetic resonance imaging study. Philosophical Transactions of The Royal Society Series A. 30/03/2016 – Mikko and Lauri discuss animal fears in Prisma Studio science documentary series (in Finnish). 25/03/2016 – Tomi’s first thesis paper on opioids and reward drive is out: Karjalainen, T., Tuominen, L., Manninen, S., Kalliokoski, K., Nuutila, P., Jääskeläinen, I.P., Hari, R., Sams, M., & Nummenmaa, L. (in press). Behavioural activation system sensitivity is associated with cerebral μ-opioid receptor availability. Social Cognitive and Affective Neuroscience. 21/03/2016 – Detailed maps of human erogenous zones published: Nummenmaa, L., Suvilehto, J.T., Glerean, E., Santtila, P., & Hietanen, J.K. (in press). Topography of human erogenous zones. Archives of Sexual Behaviour. 11/03/2016 – New mini-review on brain basis of emotions (in Finnish) out today: Nummenmaa, L. (2016). Tunteiden neurobiologia. Lääkärilehti 10/2016. 05/03/2016 – Our introductory chapter on upcoming Phil Trans B theme issue “Attending and neglecting people” is now available: Hari, R., Sams, M., & Nummenmaa, L. (in press). Attending and neglecting people: Bridging neuroscience, psychology and sociology. Philosophical Transactions of The Royal Society B. 03/03/2016 – New review on data-driven methods in social neuroscience and psychology: Adolphs, R., Nummenmaa, L., Todorov, A., & Haxby, J.V. (in press). Data-driven approaches in the investigation of social perception. Philosophical Transactions of The Royal Society B. 23/02/2016 – New paper in press: Hietanen, J.K., Glerean, E., Hari, R., & Nummenmaa, L. (in press). Bodily maps of emotions across child development. Developmental Science. 11/2/2016 – We just started a cross-cultural study on animal fears. You may participate online here. 29/1/2016 – Coverage of the lab in Helsingin sanomat.